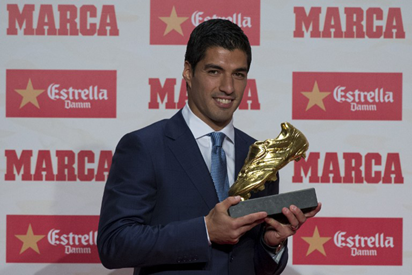 Suarez picks up Golden Shoe after prolific last season. Barcelona’s Uruguayan star Luis Suarez on Thursday collected the Golden Shoe award for the leading scorer in Europe last season and admitted he never imagined being the most prolific member of such a star-studded attack. “I didn’t imagine myself as the top scorer, I only thought about being a champion, winning the Champions League, which I have done,” said Suarez at a prize-giving ceremony in Barcelona. “I have team-mates who make it easy but I am not going to take credit from myself because it needs to be done and you need to be in the right place,” Suarez, 29, said of his goal-scoring exploits. The former Liverpool striker, who moved to the Camp Nou in 2014, scored a remarkable 40 goals in La Liga last season as Luis Enrique’s side edged out Real Madrid to take the title. That tally allowed him to pip Argentine striker Gonzalo Higuain, scorer of a Serie A record 36 goals for Napoli, to the award. Cristiano Ronaldo was third with 35 goals for Real. He said of all his goals among those that stood out came in the 4-0 destruction of Madrid at the Santiago Bernabeu. “There were many beautiful goals, important ones, but the ones I liked the most for what they meant were the two against Real Madrid and one against Atletico Madrid because it allowed us to stay top,” he said. It is the second time Suarez has won the Golden Shoe in 2013-14 he shared the prize with Ronaldo after netting 31 times for Liverpool in the Premier League. Ronaldo has won it a record four times, while Suarez’s Barcelona team-mate Lionel Messi is a three-time winner. He gave a nod to Messi and Neymar, the other member of the so-called MSN. “I am in the best team in the world, with the best players,” he said. “When you fix an objective you can reach it but the priority is the collective and winning titles as a team. “If individual prizes come with that then it’s even better. But if it’s not me who wins them then let it be Leo or Neymar!” Suarez is the second Uruguayan to win the trophy after Diego Forlan, who took the Golden Shoe when with Villarreal in 2004-05 and again as an Atletico player in 2008-09.